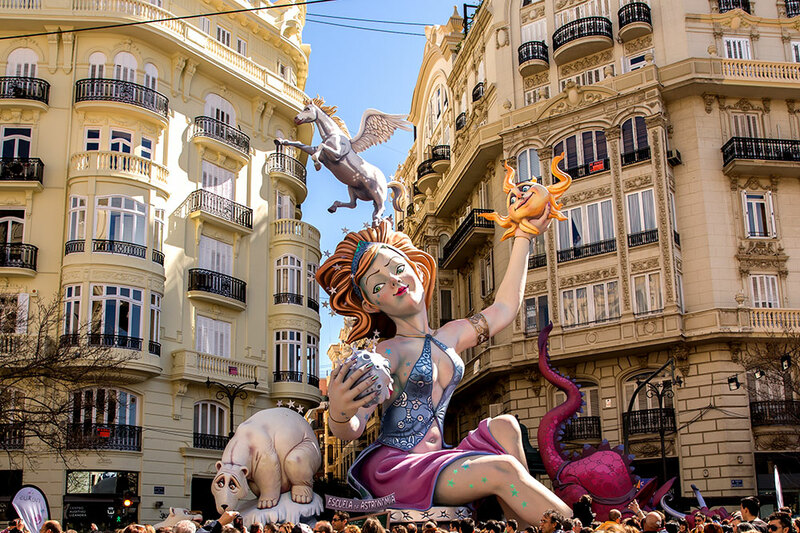 Visit the coastal city of Valencia, Spain, between March 15 and 19, and you’ll witness a flurry of activity: Firecrackers exploding on the main square, streets closed for paella cookouts and parades, and workers busily installing giant puppet figurines, or ninots, that will be integrated into a larger statue, called a falla, and eventually set ablaze in spectacular fashion. Every year, 2 million people pack into Valencia to mark one of its most important celebrations, Las Fallas, a festival on UNESCO’s Representative List of the Intangible Cultural Heritage of Humanity. Legend has it that the festival began in the 15th century when carpenters burned the wood they no longer needed to pay homage to St. Joseph, the patron saint of carpentry. Whether this was the predecessor to today’s burning of the fallas (both the name of the festival and its monuments) isn’t clear. What is certain, however, is that the modern celebrations are much more elaborate than medieval Valencians could ever have imagined. Today, what is burned isn’t just old pieces of wood; each falla is a lovingly created, elaborate work of art based on an agreed-upon theme from the neighborhood association behind it. Close to 400 associations in the city hire their own artists to create one falla for children and one for adults, with some associations spending as much as half a million euros to build structures that can be up to five-stories high. “The falla is used to satirize and criticize the world of politics,” says Tino Bendicho, the vice president of Convento Jerusalen-Matemático Marzal, an association that has been in existence for 125 years. Artists and painters earn their living making fallas, and they create a new one each year. Watching them burn is at times difficult. One artist said that while it makes him sad, it’s also exhilarating. For many, the burning signifies a new beginning. But for two days before that big finale, called the Cremà, members of each falla walk to Plaza de la Virgen with bouquets of carnations. Garbed in historic dress and often accompanied by Valencia’s traditional brass bands, they make an offering of flowers, which are used to complete the largest display of the festival, a 30-foot structure of the Virgen de los Desamparados (Our Lady of the Forsaken). When they are done her cape and dress are made entirely of carnations. 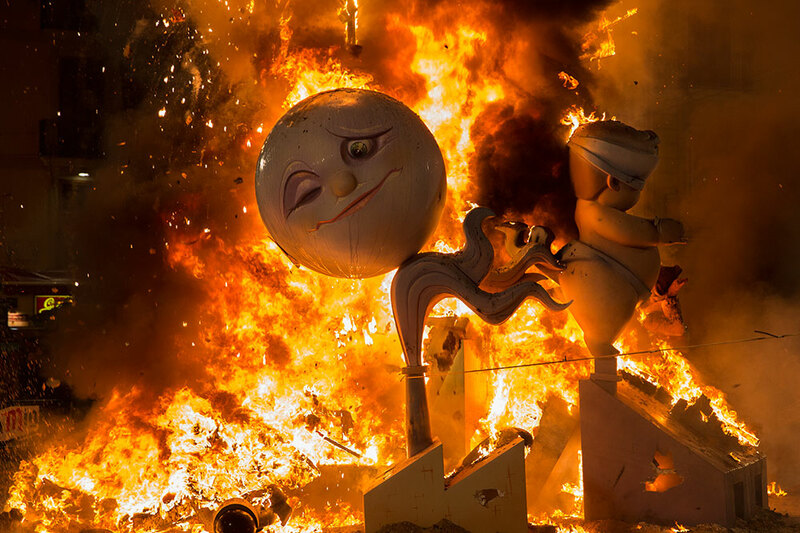 And then, on night of March 19, after a short fireworks display, all fallas go up in flames. The main falla on Plaza del Ayuntamiento is the final one to go. And as the last wisps of fire die down and firefighters traverse the city to keep it safe, the people of Valencia already begin looking forward to next year’s celebration, and the artists to their next falla.